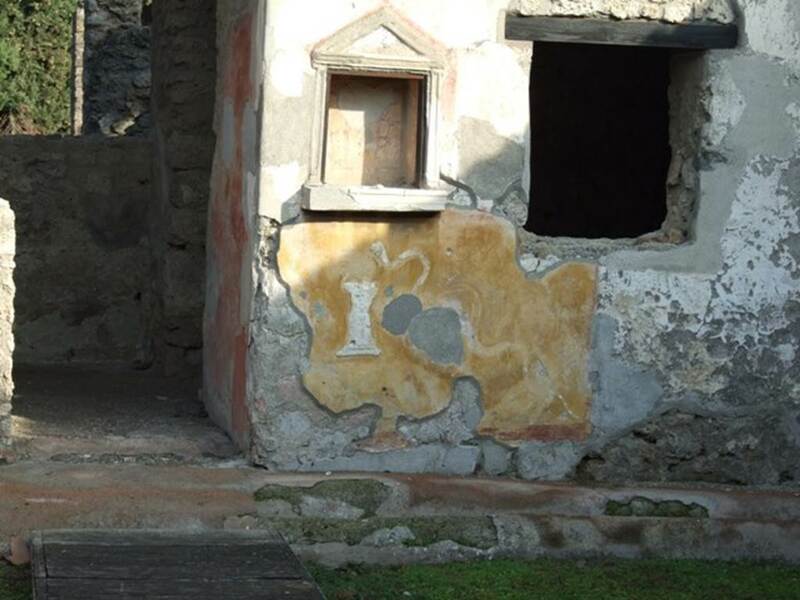 II.1.9 Pompeii. 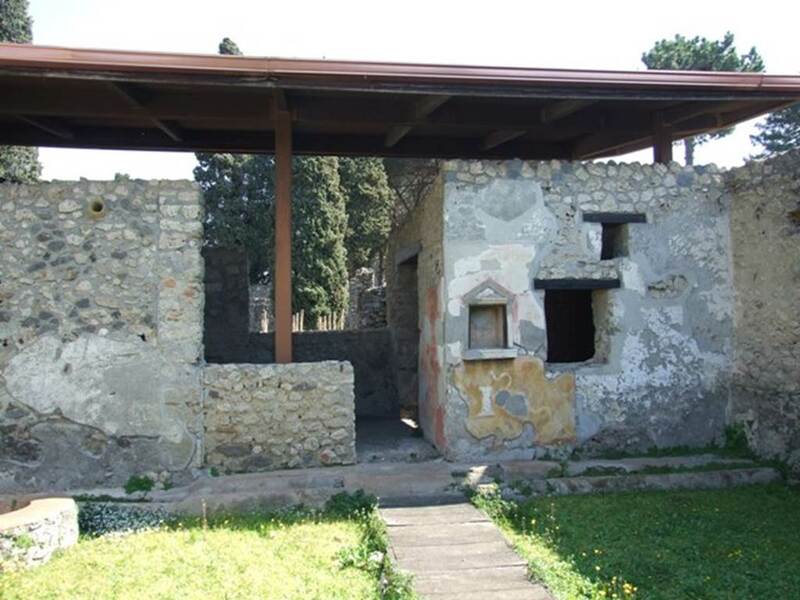 Casa del Larario di Ercole or House of Felix and Sabinus. Excavated 1938, 1951 to 1954. 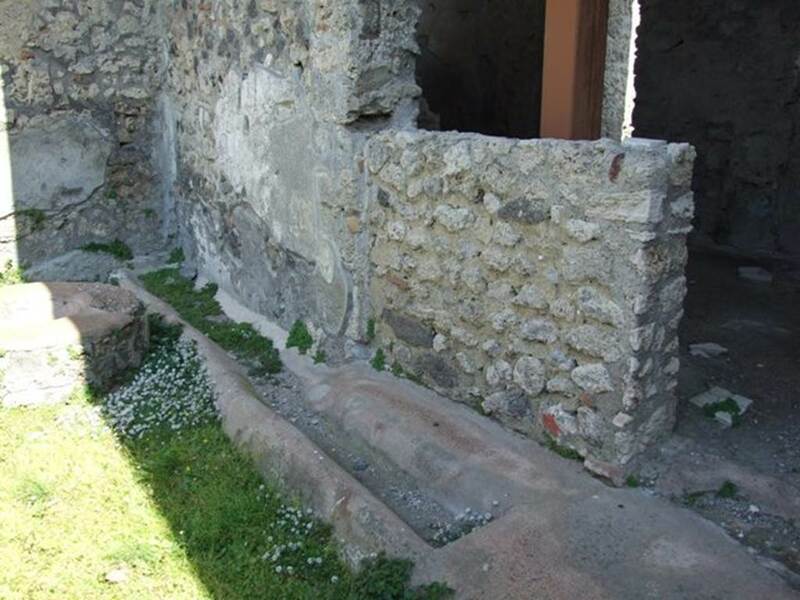 II.1.9 Pompeii, on left. 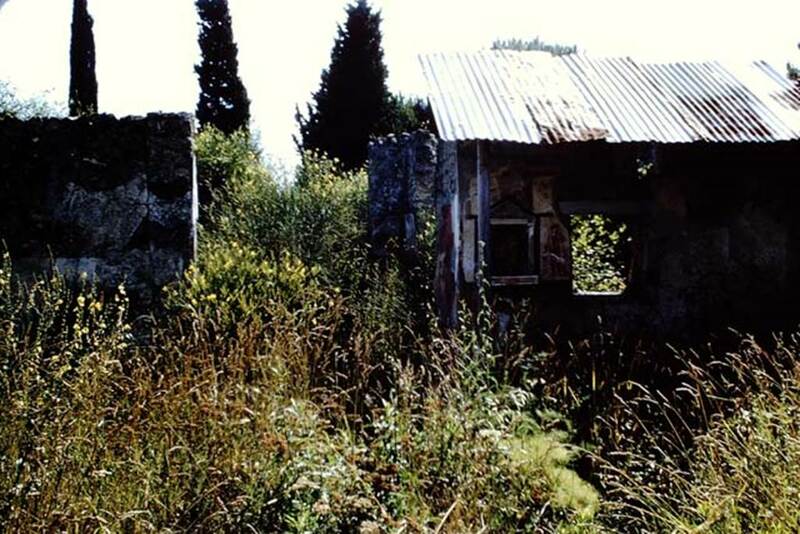 September 2004. 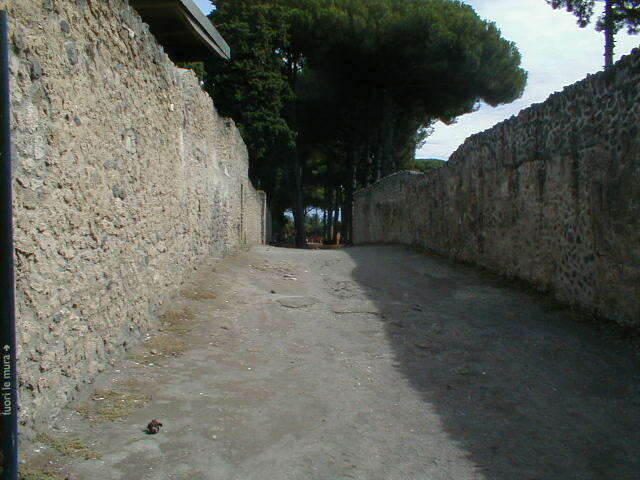 Via di Castricio, looking east. II.9, on right. II.1.9 Pompeii. December 2004. Entrance doorway. II.1.9 Pompeii. 1964. 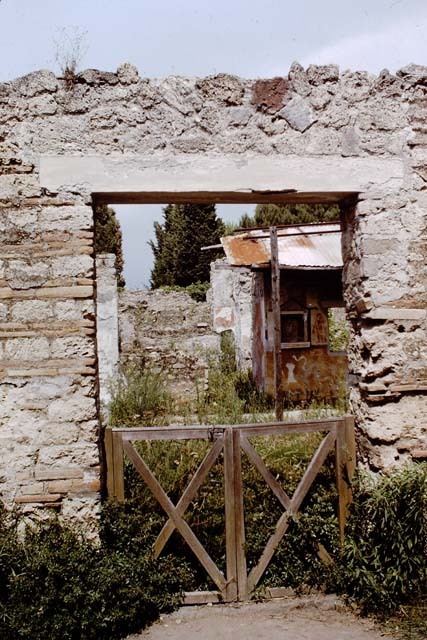 Entrance doorway. Photo by Stanley A. Jashemski. II.1.9 Pompeii. March 2009. Courtyard garden, looking east. II.1.9 Pompeii. 1966. Courtyard garden, looking east. Photo by Stanley A. Jashemski. II.1.9 Pompeii. September 2004. North-east corner with large well. II.1.9 Pompeii. March 2009. North-west corner of courtyard garden. II.1.9 Pompeii. March 2009. 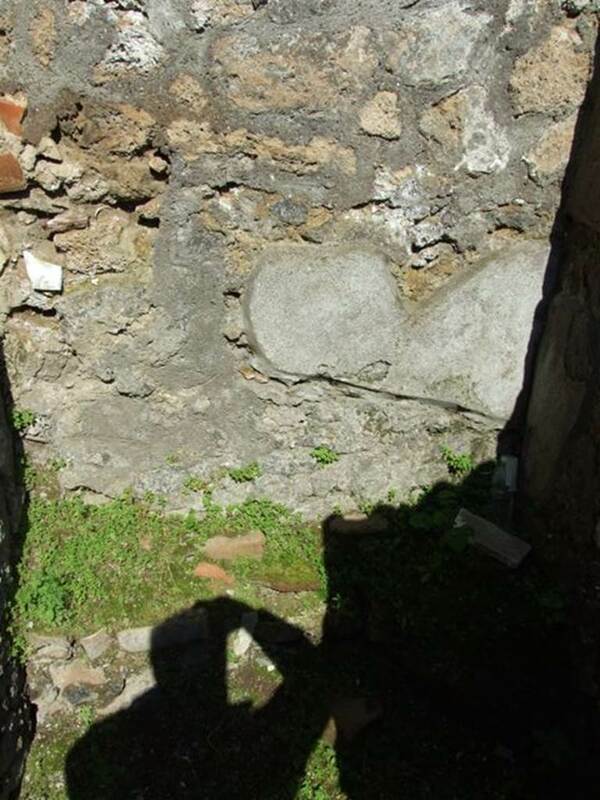 Looking north into small room in north-west corner of courtyard garden. Latrine? II.1.9 Pompeii. March 2009. Looking south-east across courtyard garden. 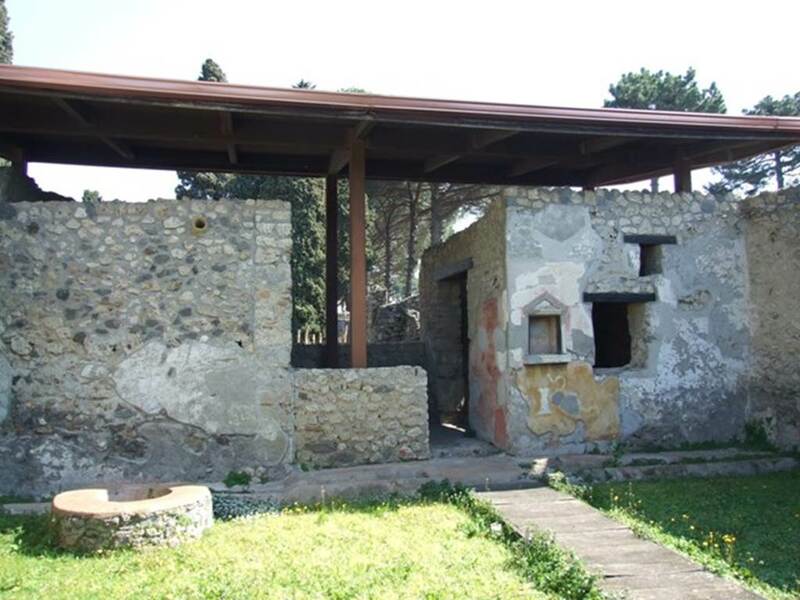 II.1.9 Pompeii. December 2007. 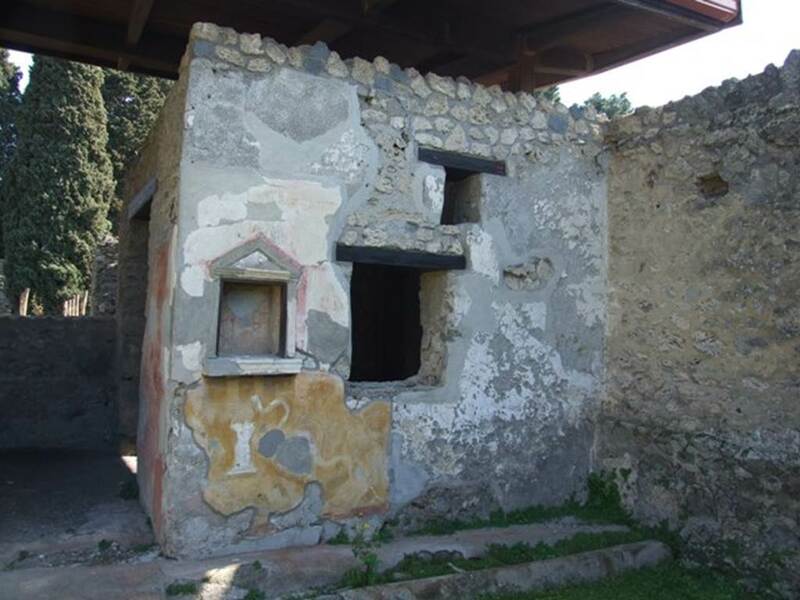 Lararium. 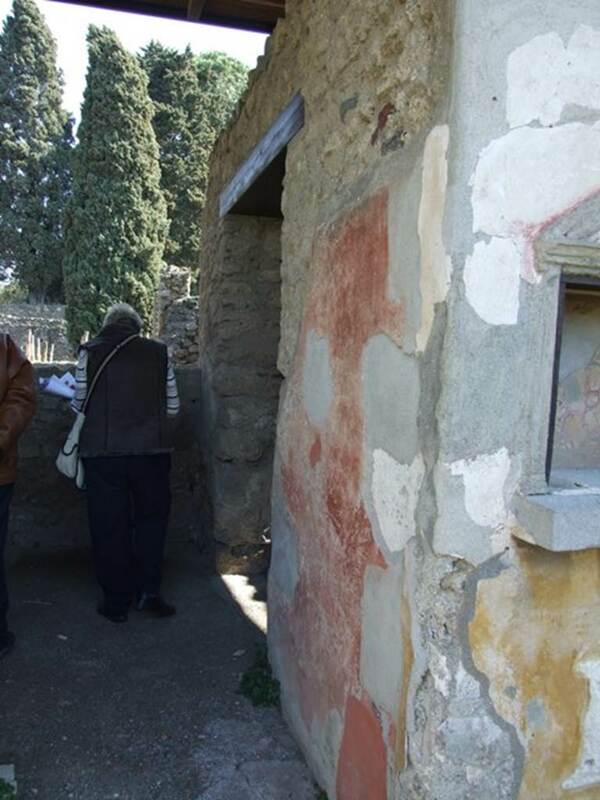 Between the niche and the window was a painting of Hercules standing with his club, now faded or missing. See Fröhlich, T., 1991, Lararien und Fassadenbilder in den Vesuvstädten. Mainz: von Zabern. (L39, p.265, T. 29, 4). 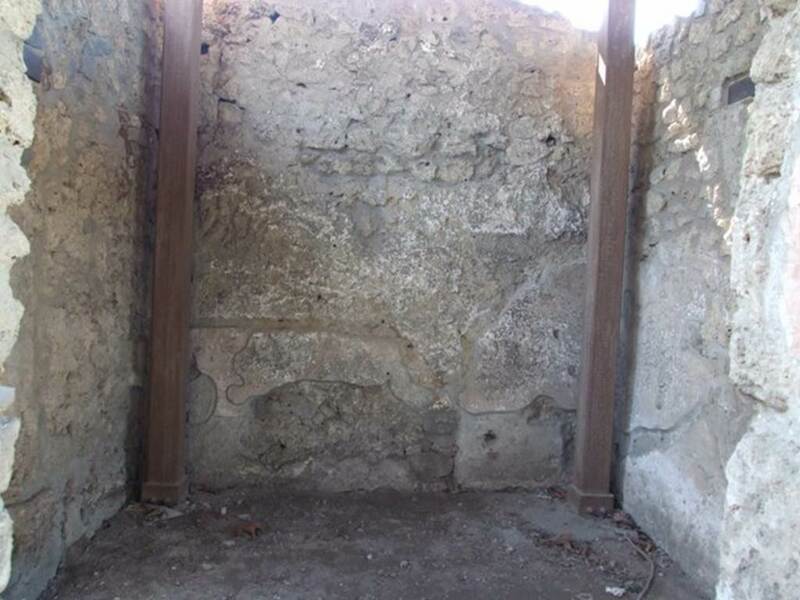 SAP photo of lararium upon excavation, and a drawing of it by Barbet, can be seen on pages 74 and 75. II.1.9 Pompeii. March 2009. 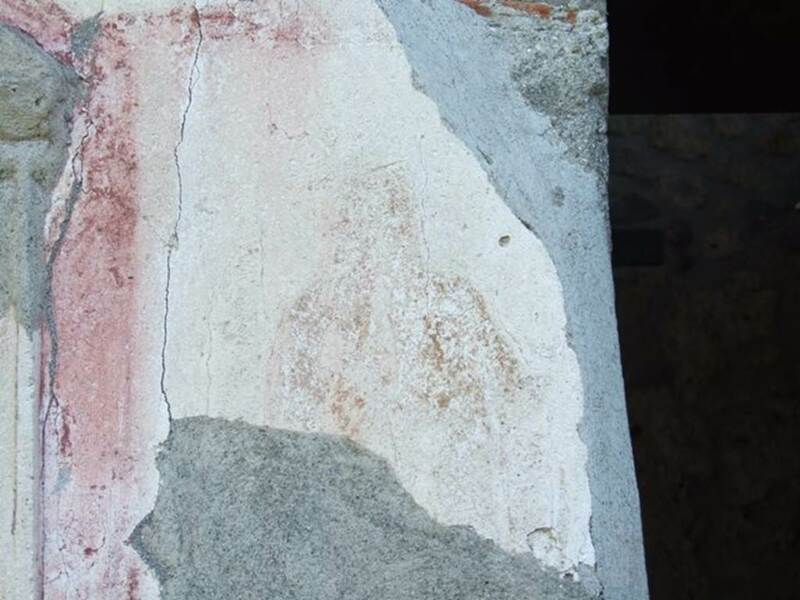 Remains of painting of Hercules, on south side of niche, in red-bordered panel. II.1.9 Pompeii. March 2009. East wall of courtyard garden, with niche lararium with aedicula. II.1.9 Pompeii. March 2009. 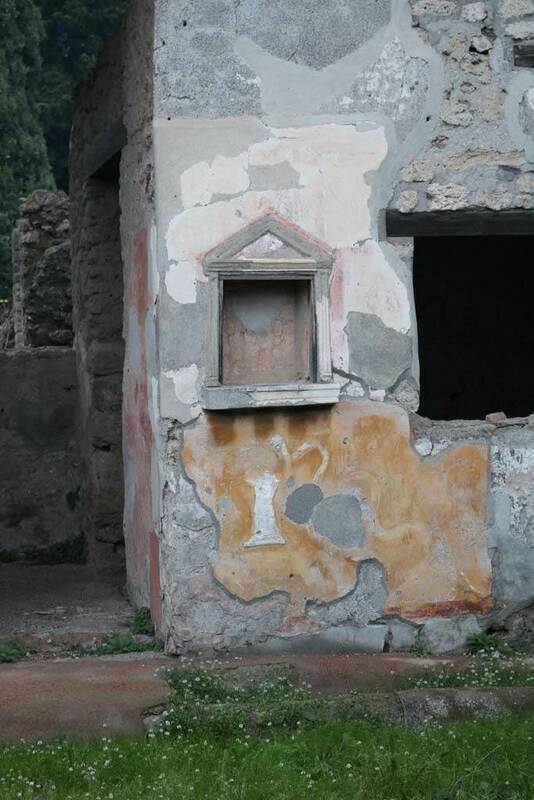 Niche lararium, with stucco altar and stucco serpent. II.1.9 Pompeii. March 2009. 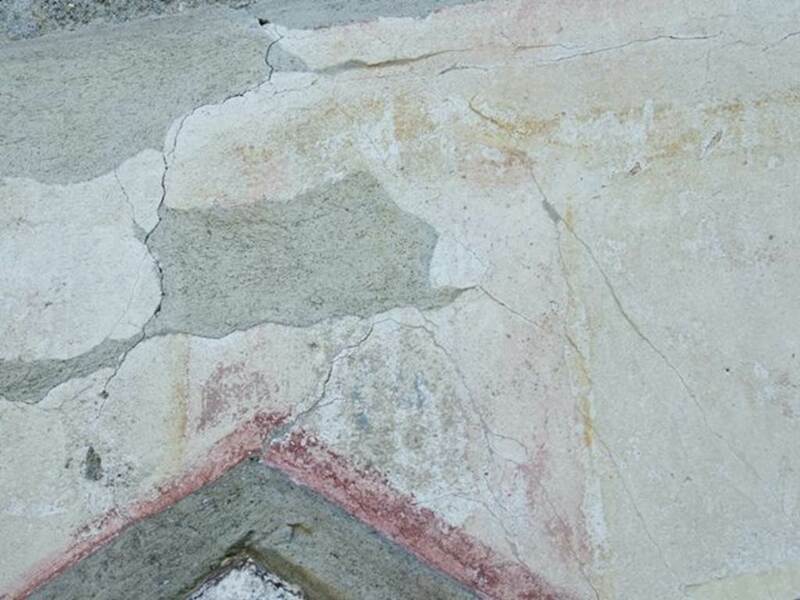 Remains of painted plaster above the aedicula. II.1.9 Pompeii. March 2009. 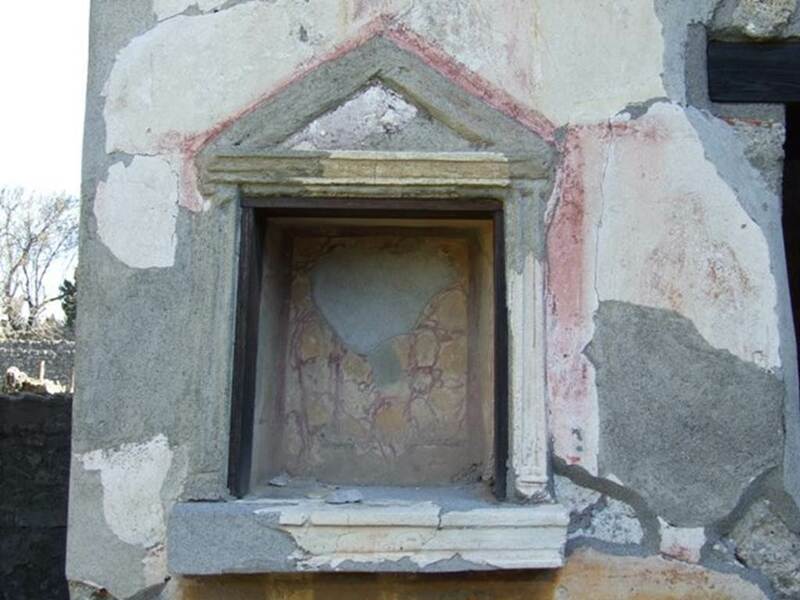 Aedicula niche lararium. 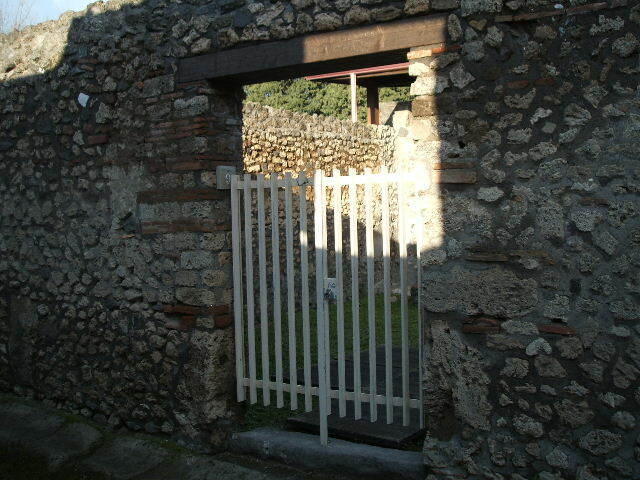 II.1.9 Pompeii. December 2007. 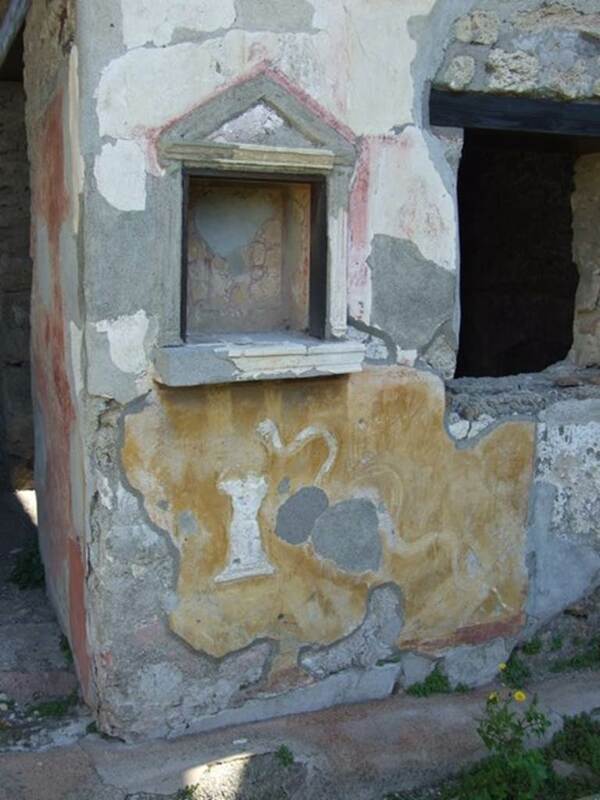 Lararium with stucco serpent and altar. 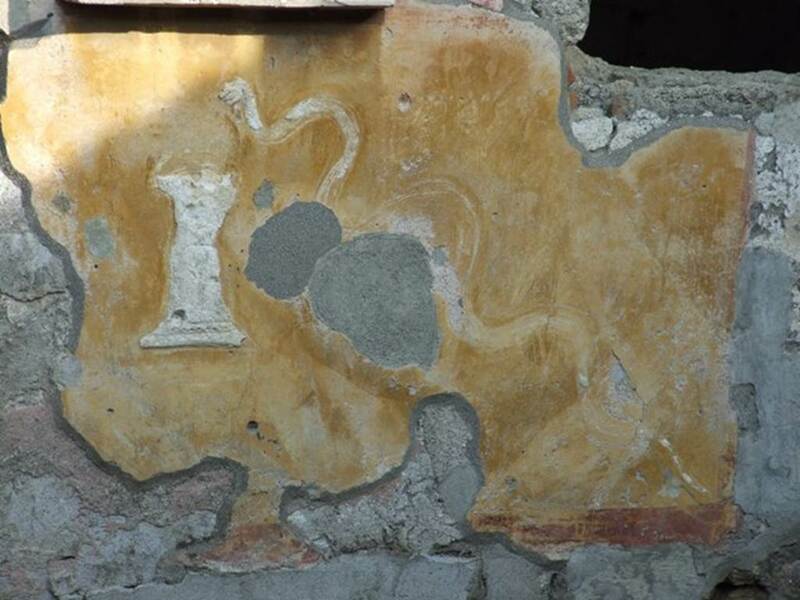 Remains of painting below the niche of a garden (now faded) with a stucco altar and stucco crested serpent. 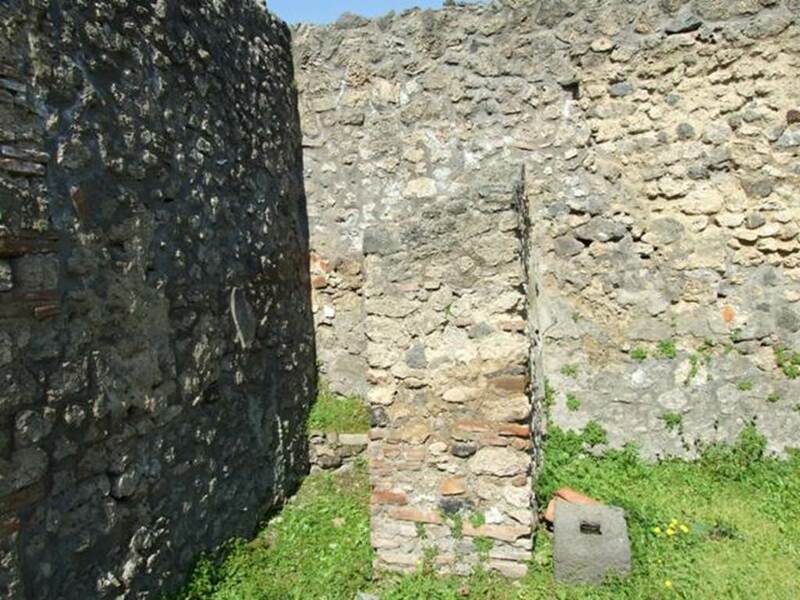 II.1.9 Pompeii. 1954. Lararium with stucco serpent and altar. 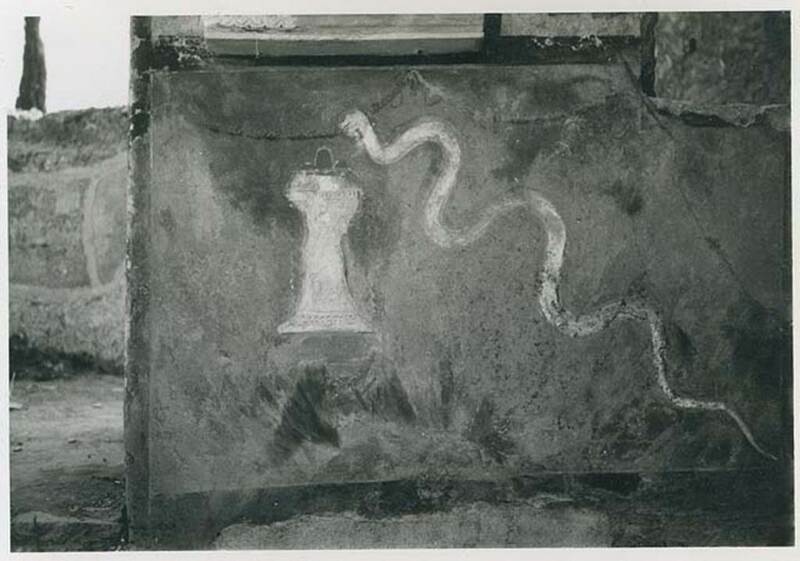 Below the niche was a painting of a garden with a stucco altar and stucco crested serpent. II.1.9 Pompeii. March 2009. 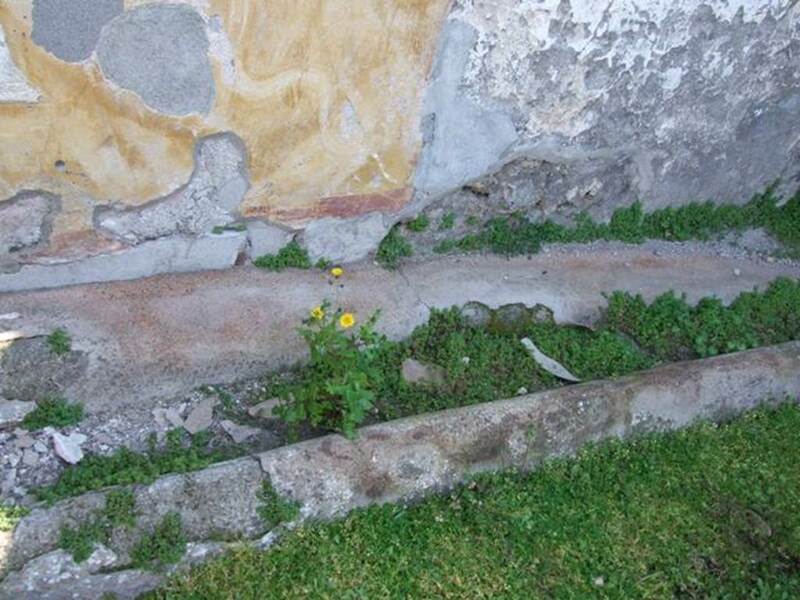 Gutter along the east edge of the courtyard garden. 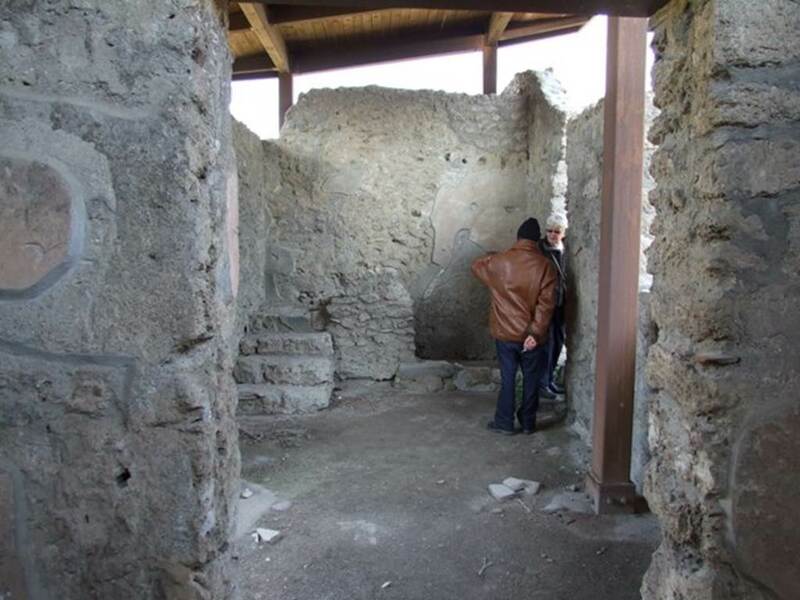 II.1.9 Pompeii. March 2009. Room 1, entrance room, with south wall and doorway to room 2. II.1.9 Pompeii. March 2009. Room 2, south wall of anteroom. II.1.9 Pompeii. March 2009. 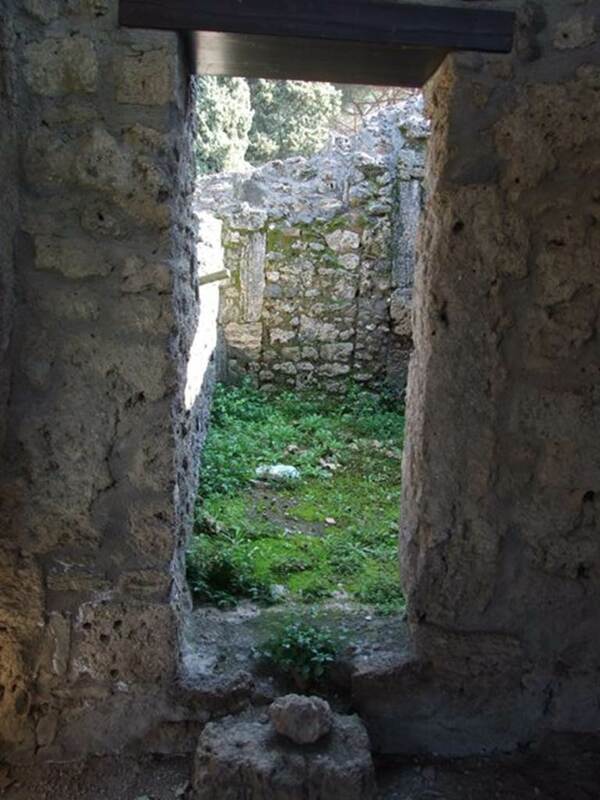 Room 2, anteroom to cubiculum, with west wall, looking into courtyard garden. II.1.9 Pompeii. March 2009. Room 2, doorway in east wall of anteroom, leading to room 3. 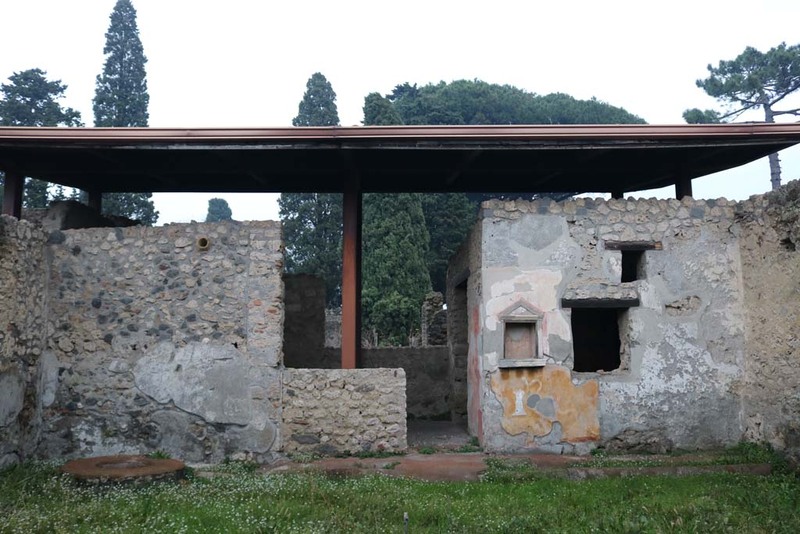 II.1.9 Pompeii. March 2009. 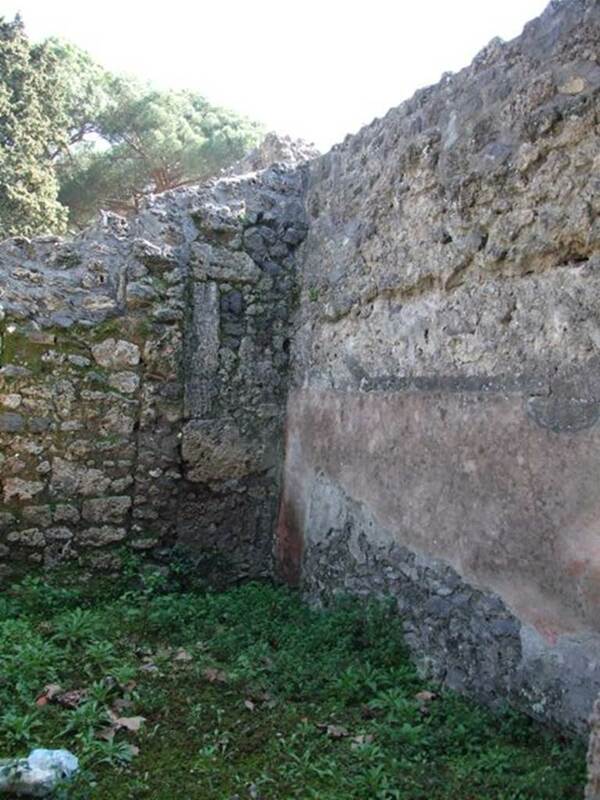 Room 3, south-east corner of cubiculum. II.1.9 Pompeii. March 2009. Room 1, entrance room, looking north from doorway of room 2. II.1.9 Pompeii. March 2009. 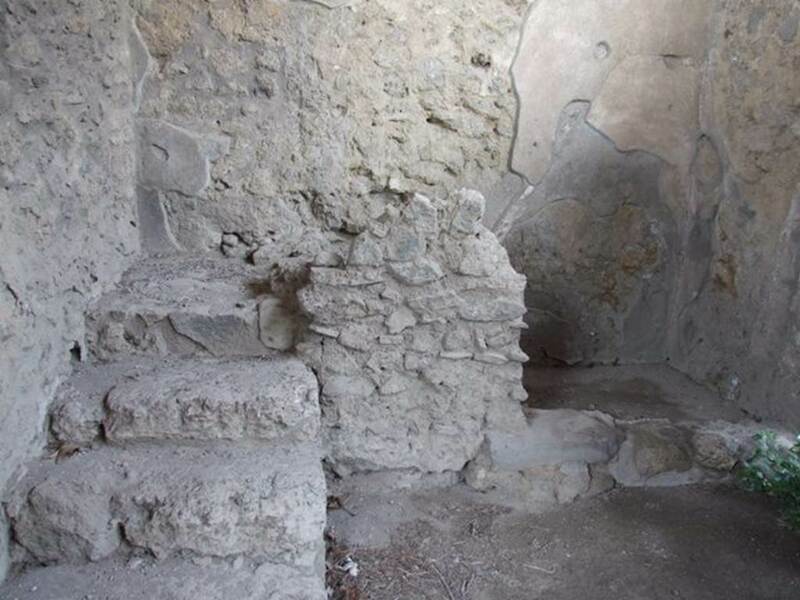 Room 1, looking north to stairs to upper floor, and latrine on the east side. II.1.9 Pompeii. March 2009. 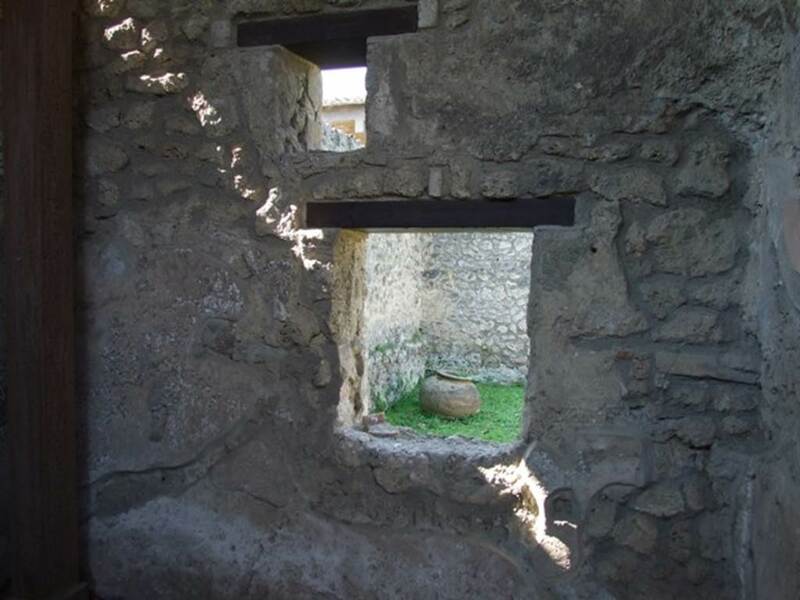 North-west corner of latrine in room 1. 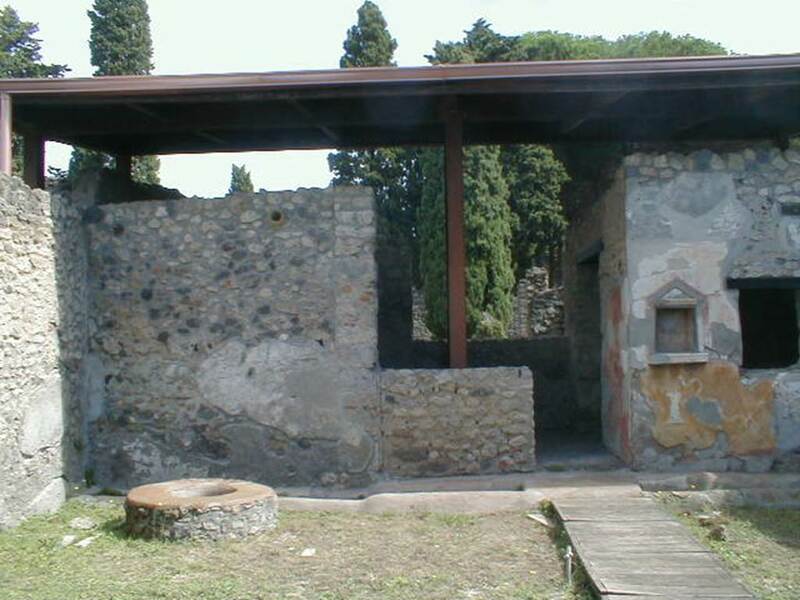 II.1.9 Pompeii. March 2009. Room 1, east wall. Looking south east from stairs.